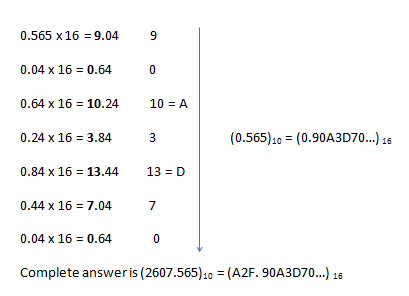 For conversion of any base R number to Decimal number system each coefficient is multiplied with the corresponding power of R and added to obtain the decimal number. For conversion of Decimal number system to any base R, the decimal number (Integer part) is divided by R and the remainders obtained at each stage are used to represent the base R representation of the decimal number system. For fractional part the digits are multiplied by R and resulting digits integer part is used to define the number. For fractional part, the digits are multiplied by two and integer part defines the number as shown below, the numbers are now read from top to bottom as shown by arrow, the multiplication is done ideally till the decimal part or fractional part becomes zero or the repetition starts. For fractional part, the digits are multiplied by eight and integer part defines the number as shown below, the numbers are now read from top to bottom as shown by arrow, the multiplication is done ideally till the decimal part or fractional part becomes zero or the repetition starts. 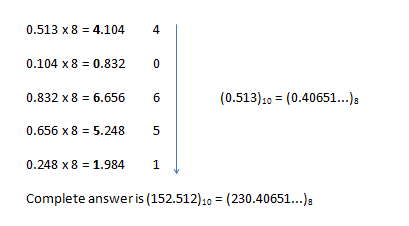 For fractional part, the digits are multiplied by sixteen and integer part defines the number as shown below, the numbers are now read from top to bottom as shown by arrow, the multiplication is done ideally till the decimal part or fractional part becomes zero or the repetition starts. Any octal digit corresponds to three binary digits. So to represent any binary number into octal number system the binary digits are grouped as three bits together from LSB to MSB for integer part of number, if groupings of three are not possible then zeroes are padded before the MSB and for fractional part the groupings are done towards right of decimal point and zeroes are padded towards right at the end of the number to make groupings of three. For converting any octal number to binary, the binary representation as detailed above in Table 1 is to be written for each octal digit. Any hexadecimal digit corresponds to four binary digits. So to represent any binary number into hexadecimal number system the binary digits are grouped as four bits together from LSB to MSB for integer part of number, if groupings of four are not possible then zeroes are padded before the MSB and for fractional part the groupings are done towards right of decimal point and zeroes are padded towards right at the end of the number to make groupings of four. For converting any hexadecimal number to binary, the binary representation as detailed above in Table 2 is to be written for each hexadecimal digit.